You will earn 17,779 Reward Points. Earn 1 reward point for every 1 dollar spent. Cooking Capacity for up to ten 12˝ x 20˝ x 2 1/2˝ deep Cafeteria Pans, five each compartment. Each compartment has one, 60-Minute Electro-Mechanical Timer with "SureCook" load compensating feature. Manual Bypass Switch for constant steaming. 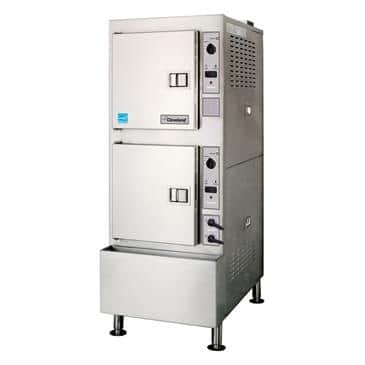 Cleveland Gemini 10 SST Model 24CGA10.2ES, Two compartment steamer with SteamSaver™ Technology and Energy Star approved, Independent steam generators, 50,000 BTU's input per compartment. "SureCook" electro mechanical timer with load compensating feature. Gas valve and water level control system. Exclusive remote probe-type water level controls. Exclusive Brass “Steam Jet” distribution system. Two-piece free-floating compartment door. 14 gauge stainless steel cavity and door. Pullout service drawer for controls and Gemini Drain/Power Control System.